Nordhavn’s industrial generator systems ensure a reliable power supply for companies and organisations with safety-critical functions, where power failure can result in substantial financial loss or in worst case, loss of human lives. We are known for safety and reliability and deliver credible consulting based on extensive knowledge. 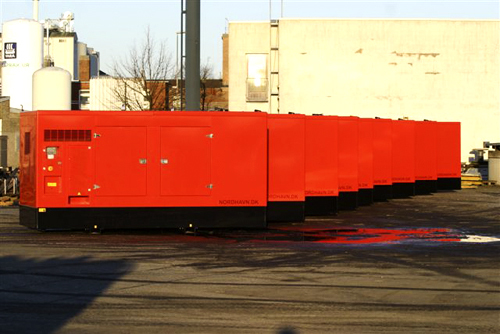 Nordhavn delivers generator systems for main power and emergency power for heating plants, hospitals, banks, airports, refugee camps, building sites and dairies, but can cover virtually any need for power supply. Nordhavn also delivers diesel engines for OEM purposes from some of the world’s leading brands. We have the necessary skills to take part in the development of OEM products. Diesel engines are used in many different contexts and for many different purposes. Whether the product in question is a diesel engine application for e.g. pump unit, a concrete crusher or a sand sucker, we have the experience and expertise to deliver engine, consulting, service and spare parts. Even for more specialised jobs, we have a solution. We perform service and maintenance all over the world on all types of diesel engine applications, generator and emergency power systems.